It’s like a south-of-the-border summer vacation of a platter. 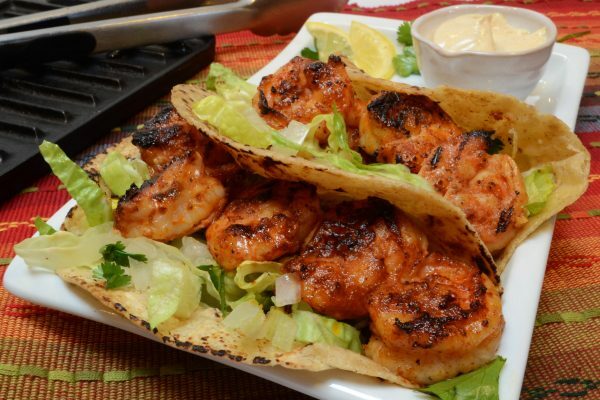 Plump, fresh shrimp seasoned in a spicy, citrusy marinade, char-grilled, and then tucked into a soft tortilla with a drizzle of zesty cream sauce on top. It says, “summer.” It screams, “more, please!” This was a recipe that was served at a pool party that I attended a few years ago. The tortillas were flour and street-taco sized. The tacos were served on a giant warm griddle with plenty of lime wedges, and the cream sauce was offered in plastic squirt bottles chilling in a tray of ice. I left that party purring contentedly with the recipe in my purse. The marinade, my host had mentioned, was an adaptation from a spicy shrimp recipe in the iconic Silver Palate Cookbook. She had replaced the chopped dill with cilantro for a more southwestern flavor. The kicked-up marinade and zesty finishing sauce makes this dish perfect party fare or a satisfying supper anytime, especially during grilling season. Just remember to make it fresh, and don’t skimp on the shrimp! Soak skewers in water for about 20 minutes so they won't burn on the grill or in the pan. Prepare the Zesty Cream Sauce and refrigerate. In a bowl, whisk together the olive oil, chili powder, garlic, lime juice, cilantro, salt, and pepper. Add the shrimp, stirring to coat. Marinate the shrimp for 30 minutes and skewer the shrimp, 4 shrimp per skewer (make sure the pan or grill is large enough so the skewers lay flat). Heat the grill or skillet to medium high heat. Place the shrimp on the lightly oiled grill or in the skillet and cook until they are a deep golden-brown on each side, about 1 ½ minutes per side. Remove the shrimp from the skewers. Slather the Zesty Cream Sauce on the inside of the tortilla. Add the shredded lettuce, 4 shrimp, and drizzle more sauce over the top. Serve with a lemon wedge and avocado slices. Mix together all ingredients and refrigerate until ready to serve.